Home RPG News tremulus General Availability, Dark Frontier Adventure Path, Bluffside, and More! Here’s a look at today’s new, third party, accessory, and diversion releases. Necromancers of the Northwest [visit their website here] brings to you their latest set of Exotic Encounters for Pathfinder, featuring Cyclopes. “This particular installment of Exotic Encounters focuses on the cyclops. These terrible, one-eyed monsters have plagued human imagination since antiquity, and, in some recent campaign settings, are depicted as having ancient roots themselves, and being the descendants of a mighty empire of diviners, which fell long ago.” Written by Alex Riggs and Joshua Zaback, it’s available for purchase from DriveThruRPG: Exotic Encounters: Cyclopes. Black Falcon Games [visit their website here] introduces more Elite Enemies in Demonic Adversaries. “Elite Enemies – Demonic Adversaries provides the Game Master with twenty ready-to-use Pathfinder Roleplaying Game® compatible demon-related stat blocks, one for Challenge Ratings 1 through 20! Variation and challenge is achieved through a combination of class levels, simple templates, and advanced templates.” Written by Charles Plemons, it’s available for purchase from DriveThruRPG: Elite Enemies – Demonic Adversaries [PFRPG]. After a successful Kickstarter campaign, Fire Mountain Games [visit their website here] has released for general availability the first book of their Throne of Night adventure path – Dark Frontier. “Build an empire beneath the earth! The drow call this region of the underworld the Azathyr. It is a vast sprawling labyrinth full of wonders and horrors. For the unwary, it is a death trap. For the bold and resourceful it is a gateway to power and riches. Are you clever enough to tame this weird wilderness? Do you have what it takes to claim for yourself a Throne of Night?” Written by Gary McBride, it’s available for purchase from DriveThruRPG: Throne of Night Book One: Dark Frontier. Funded through Kickstarter, Reality Blurs has launched for general availability their Apocalypse World Engine-powered tremulus, the new storytelling RPG of Lovecraftian horror [view our entry in the Roleplayers Chronicle Reference database here]. 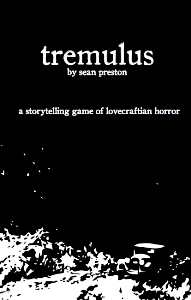 “tremulus is a storytelling RPG where you and your friends get together and create a haunting story in the vein of HP Lovecraft’s works. Want to See Something Really Scary? We all do. tremulus lets you and your friends make terrifying stories together. No experience necessary. And dice? You only need a pair of regular old six-sided dice, like you find in most family board games. If you’ve never played any roleplaying games in the past, then this is a great game to start with.” Written by Sean Preston, it’s available for purchase from DriveThruRPG: tremulus. White Wolf and Onyx Path Publishing [visit their website here] has released a new Convention Book for Mage: the Ascension, with more 21st century ideas in Void Engineers. “The Void Engineers are hiding something. They’ve traded many of their ideals for guns, turned vessels of peaceful exploration into mobile defense platforms, and — most frightening to the Union — forged themselves into an organized military. They’ve kept the rest of the Technocracy grounded as they fight a mysterious war beyond the boundaries of Earth against adversaries too heinous to name.” Written by Lillian Cohen-Moore, Ryan Macklin, Josh Roby, Malcolm Sheppard, and Jeremy Tidwell, it’s available for purchase from DriveThruRPG: Convention Book: Void Engineers. The latest Firefly Echoes of War adventure module from Margaret Weis Press is now available – Friends in Low Places [view our entry in the Roleplayers Chronicle Reference database here]. “Sometimes meeting up with old friends in Serenity View is cause for celebration, but not this time. Over drinks, you and your Crew discover that Monty’s new wife Daisy has gone missing. Worse, your pal thinks that Virgil Morningstar, a Guild trader with a heap of Alliance connections, had something to do with her disappearance. By the time you find out Daisy ain’t the only one who’s vanished, you and your Crew’ll be neck-deep in trouble and hard-pressed to find your way out of it. Thing is, if you do unravel this little mystery, you’ll claim a big reward and be heroes to boot.” Written by Monica Valentinelli, it’s available for purchase from DriveThruRPG: Firefly Echoes of War: Friends in Low Places. Looking to expand your Traveller starport encounters? Mongoose Publishing has done just that in their latest release Supplement 13: Starport Encounters [view our entry in the Roleplayers Chronicle Reference database here]. “It happens to every referee at one time or another. The players jump in-system, dock at a starport, offload passengers and cargo, and then ask a string of questions. ‘So, what other ships are in the port?’ ‘This cargo of pharmaceuticals – which does it actually contain?’ ‘I go to the bar for a few drinks. Who else is around right now?’” Written by Andy and Sarah Lilly, it’s available for purchase from DriveThruRPG: Supplement 13: Starport Encounters. Troll Lord Games [visit their website here] has brought Bluffside: City on the Edge to Castles & Crusades. “Welcome to Bluffside: City on the Edge, a boom town boasting the most precious metal in the known world – adamantine. Perched upon high cliffs overlooking the deep waters of Crater Bay Bluffside’s many districts sprawl into the country beyond, climb the cliffs and ride the waters. Here is a city forged on power, where corruption mingles with purity and men contend with one the other for gold or glory, for the greater good or the selfish turn.” Written by James Govreau, Curtis Bennett, Andrew Troman, Jeff Quinn, Warren Bailey, Hal Greenberg, Peter J. Schroeder, Derrick Landwehr, Warren Bailey, Brian Boonstra, Becky Glenn, and Doug Herring, it’s available for purchase from DriveThruRPG: Castles & Crusades Bluffside City on the Edge. Barrel Rider Games [visit their website here] is bringing the classic story Sleepy Hollow to the world of Labyrinth Lord with creature stats, a character class, firearms rules, and more. “With these words Washington Irving introduced the world to the tiny town of Sleepy Hollow and forever changed the literary world. Now revisit this tiny hamlet and its most famous residents with Sleepy Hollow! This 30-page source book is designed for use with Labyrinth Lord (and other old-school fantasy role-playing games) and inside you’ll find all kinds of resources for your campaign!” Written by James M. Spahn, it’s available for purchase from DriveThruRPG: Sleepy Hollow. Mayhem in Paper [visit their website here] has released four new paper miniatures sets for their Fantasy Adventure series – Kobold Warband, Berserker Warband, Ogre Marauders, and Monstrous Golems. All of them are designed by J. Hartman and available for purchase from DriveThruRPG: Kobold Warband | Berserker Warband | Ogre marauders | Monstrous Golems. Crooked Staff Publishing [visit their website here] has released their latest map pack for Into the Wilderness. “Into the Wilderness: Map 4 is a map-pack by Crooked Staff Publishing that depicts the layout of a single wilderness encounter area (in this instance a circle of standing stones).” Designed by Kristian Richards, it’s available for purchase from DriveThruRPG: Into the Wilderness: Map 4. Paizo Publishing [visit their website here] has released their latest Pathfinder Tales novel Stalking the Beast. “The elven ranger Elyana is no stranger to tracking dangerous foes, but her latest quarry will have her using all of her skills to unravel its origins. In Pathfinder Tales: Stalking the Beast, author Howard Andrew Jones returns to explore some of the more dangerous wilds near the River Kingdoms with characters familiar to readers of Plague of Shadows. Leaving a trail of dead bodies in its wake and the ability to vanish from sight, mercenaries of every character join the hunt…but is there more to the murders than a hungry beast? The wilderness of the River Kingdoms will test all their friendships and abilities to their limits—even break them—and old hatreds will resurface in this motley band of hunters.” Written by Howard Andrew Jones, it’s available for purchase from Paizo’s webstore: Pathfinder Tales: Stalking the Beast. Paizo Publishing and WizKids [visit their website here] has released their latest Pathfinder Battles miniatures set Legends of Golarion. The creatures of the Pathfinder Campaign Setting are many and varied, from lowly goblin to inscruable aeons. You may have a fistful of skeletons in your miniature army—but what about moonbeasts, derhii, or the Sandpoint Devil? Pathfinder Battles—Legends of Golarion fixes that, and you’ll get over 50 new miniatures to add to your collection! Meet five kinds of genies, Sajan the Iconic Monk and Lini the Iconic Druid, as well as Reefclaw, Serpentfolk, Seugathi, and Tatzylwrm! But don’t forget! If you buy a case of Pathfinder Battles, you’ll be able to grab the Gargantuan Green Dragon miniature (a perfect and terrifying addition to any forest encounter).” It’s available for purchase from Paizo’s webstore: Pathfinder Battles: Legends of Golarion.